Click here to see a map of where we are right now. This is the Datastorm Users map, we are #787. Click on Weblog to read our current entries. For information on our business, click on Geeks on Tour . To see a little tutorial movie about the Blog, click here. 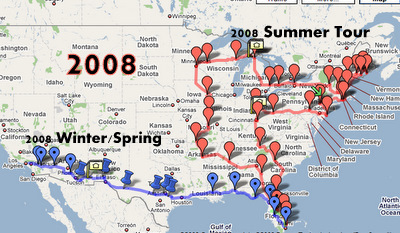 We've been living/working in our motorhome full-time since July 2003, our house sold in November of that year. 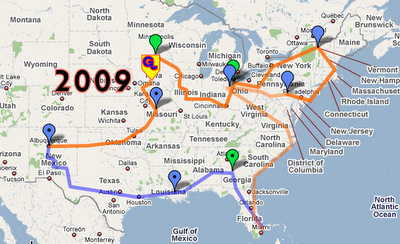 We've been on the road since April 2004. Our life's story, since deciding to become RVers, is on our Weblog! It's a wonderful thing for fickle memories. "When were we at Devil's Tower?" "I don't know - check the weblog!" The index below is the easiest way to see something in our past. The primary organization is by month. Click on any month to see all entries for that month. The later entries are at the top of the page, as you scroll down, you are going back in time. Several items have their own link just to that one entry. We keep this Weblog for ourselves, our family and friends. But, anyone else who is interested ... Welcome to our adventure! To read all the posts for a month, you need to click on the link for the month. 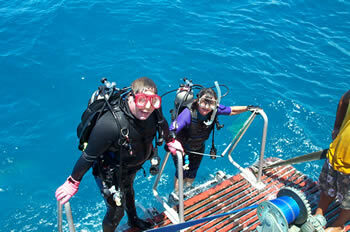 Or, to see the Picasa Web album for that month, click on 'Photos Only.' Any links listed below each month are highlights - links to individual blog posts. 6/30: Tomorrow is THE Day! 2/25-29: FMCA Pomona: Into something Good! Aug 9: Lynne and John Kayuba too! April 16: One Year on the Road! 4/25/04: The decision to sell the house and go. 4/5/03:First entry. Just dreaming about RVing. See where we are and what we're doing now by viewing our Weblog. We started a weblog when we first had the idea to get an RV. We keep it going with new entries at least once each week. It's so easy to upload photos too. If you want to start your own weblog, check out www.blogger.com. Scuba Diving and Kayaking: There's nothing better than paddling your kayak out in the ocean on a Saturday morning, then rolling into the water and going scuba diving! We do it every weekend that weather permits. We're not alone in this - we belong to a kayak and scuba club called "Kayuba". Kayak Scuba. What we do. In 2000 we traveled to Ireland, Cancun and around Florida. In 2001 we went to France and Jim drove a houseboat (barge) up the Saone river with Chris and 4 other women enjoying the ride. Visit our pre-2002 photo albums.